Busan is planning to transform into a bustling business hub for retail, film and the Internet of Things as it hosts the nation’s seventh center for creative economy. The Busan Center for Creative Economy and Innovation, which opened on Monday, is the latest in a series of government-driven regional offices helping to nurture start-ups and venture companies across the nation. The Ministry of Science, ICT and Future Planning has teamed up with Lotte Group, a local retail and entertainment giant, as well as the city government for the project. 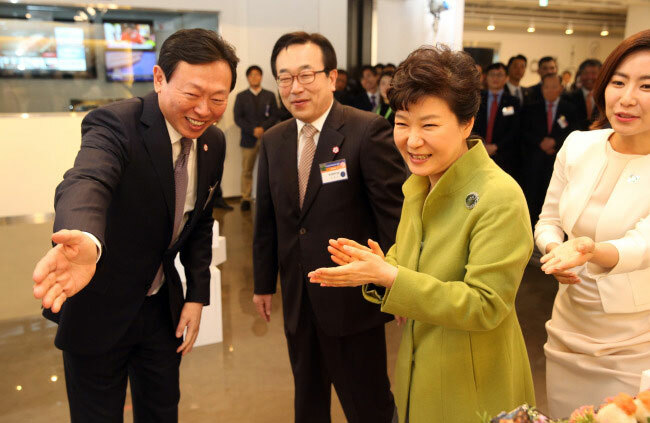 The opening ceremony was attended by some 150 VIPs, including President Park Geun-hye; Future Planning Minister Choi Yang-hee; Busan Mayor Seo Byung-soo; and Lotte Group chairman Shin Dong-bin. “I believe the Busan center will bolster the city’s convergence DNA and elevate its global presence,” President Park said in her congratulatory speech, urging citizens and business people to visit the new business hub. The Busan center is located at Centum City, an industry park near Haeundae beach in Busan. A total of 230 billion won ($200 million), including 90 billion won for funding start-ups, will be injected into related projects, officials said. The center will focus on three key industries ― retail, film and the Internet of Things technology. Lotte will play the leading role. It aims to create a new business hub for the retail industry as it shares its marketing and branding know-how with local firms, while helping them secure sales channels and better promote their products. The group also plans to offer a new distribution model combining online and offline stores, targeting Busan’s traditionally strong industry items such as shoes, clothes and seafood. Lotte will create a new ecosystem for the whole process of filmmaking in the city, based on Busan’s abundant infrastructure for the film industry, with the city currently hosting the Busan International Film Festival, Asia’s largest film festival. The center will also play a key role in the Internet of Things and speeding up the industrial application of new technologies and nurturing related start-ups. The government has launched seven creative economy centers across the nation in partnership with large conglomerates, including Samsung Electronics, Hyundai Motor and LG Electronics. An additional 10 centers are planned to open in the coming months.